Do you eat Good Food Made Simple? What exactly is Good Food Made Simple? 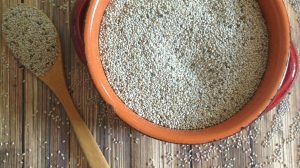 I bet you could come up with a great definition, but did you know that it is also the name of a national, all-natural packaged food company that makes good, CLEAN, food? We make GOOD foods, with taste that comes from nature, not additives. We make SIMPLE foods with ingredients that come from farms, not labs. 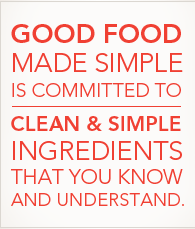 At Good Food Made Simple, we vet all our ingredients to meet our strict CLEAN food criteria. 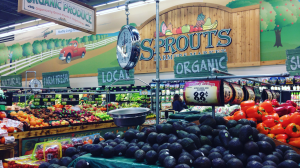 We never use artificial preservatives, flavors, colors or sweeteners. We never use hydrogenated oils. This past year, Good Food Made Simple lauched a campaign called Eat Clean, Eat Simple. The campaign callenges us to take control of what we are eating simply by reading the ingredients on the package before you buy. I have a simple question for you – Do you read the ingredient list while shopping? I do. Often. If I recognize all the ingredients that is awesome and usually a very good sign. For example, if my normal bread is not on sale I may look for another brand. Did you know that most name-brand breads are made with high fructose corn syrup? gross! I read the label and make sure that my new loaf does not contain that. Here is an easy one. Peanut Butter. I want the ingredients to contain two foods. Peanuts. Salt. That is it! Reading Ingredient Lists is As Important as Caring for Your Body! REAL STAT: Only 35% of people surveyed reported that they always look at the ingredients label. Ingredient lists can sometimes look like something you’d find in a chemistry lab – and not something you want eat. REAL STAT: Of people who look at the ingredient list on packaged foods, only half do so to make sure that all of the ingredients are CLEAN. Finding foods with clean ingredients may be tough, unless you know which brands to trust. Good Food Made Simple ALWAYS uses clean ingredients in their wide variety of foods – including oatmeal, burritos, egg patties, breakfast bowls and macaroni and cheese. REAL STAT: 41% of people say they only sometimes read ingredient lists because they don’t have time and just over one in five say it’s because they don’t understand most of the ingredients. Which is understandable when you see words like Potassium Bromate and Monosodium Glutamate are hard to pronounce and understand. REAL STAT: When asked if they would buy a product with trans fats, only 11% of people say never and 34% say sometimes. Studies have shown that even a small amount of trans fat can result in an increased risk of coronary heart disease! The bottom line…You need to Trust the companies are you buying from. Find cook books on Amazon for Good Food Made Simple for easy recipes. Do you read ingredient labels while you shop? I partnered with Good Food Made Simple and The Motherhood for this healthy post. All opinions are my own. Thanks for sharing. I am bad at reading labels. That is something I will be working on this year. I do read labels all the time but it is hard to find many foods with so few ingredients. And I can't eat peanut butter anymore because it gives me migraines. I wish that I was happy eating only fruits and vegetables. We are big fans of clean eating! It's nice to see brands making products that fit the bill!